These were very easy to make, considering I’m not a fan of frying food due to the mess. There are many ways to serve the fried bananas. We chose to serve them with ice cream. 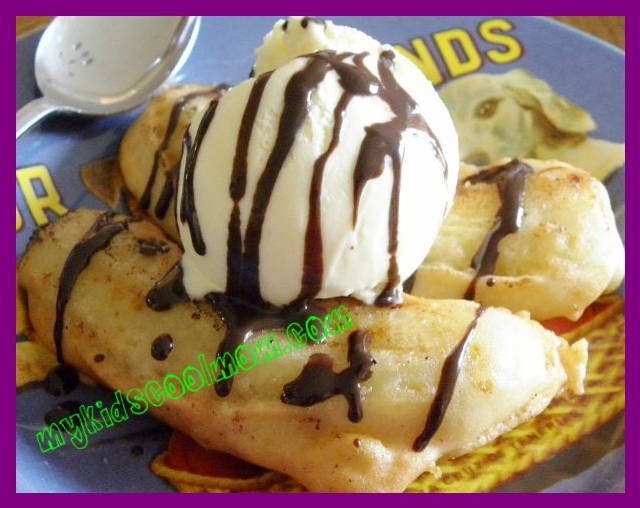 You can also add peanuts to the ice cream or just sprinkle the fried bananas with confectioners sugar or drizzle with honey and cinnamon. Another thing to note about these fried bananas is that they are gluten free! Heat up the oil in a frying pan. Meanwhile, mix the flours, sugar and salt in a medium bowl. Then, *******gradually******* add the milk until you get the desired consistency for the batter. Cut the bananas in half and then slice down the middle so you have 4 pieces. Dip the bananas one at a time in the batter and then carefully transfer to the frying pan. Allow it to fry for about a minute or until it turns light golden brown, then flip it over to fry the other side. Be careful not to put too many in the pan at once or they will stick together and be difficult to flip. Once removed from the pan, let them drain on paper towels. To serve, top them with confectioners sugar, cinnamon, honey, ice cream or chocolate fudge. Re-pin this recipe HERE on Pinterest. ***Update*** If you make too much, you can freeze the leftovers in a Ziploc freezer bag. When you are ready for more, just heat them up in the oven at 400 degrees on a baking sheet for 5 minutes, flip and heat another 5 minutes.